About the Author: Daichi Iimura, M.S., is a speech-language-hearing therapist. He received a Master’s degree in informatics from Kyoto University. 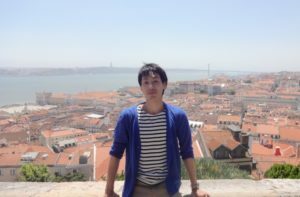 He works at a care and rehabilitation hospital, and is a Ph.D. student at the Graduate School of Comprehensive Human Sciences, University of Tsukuba. He is a representative of the We-Stutt-Project (a self-help group for young people who stutter in Japan), a director of Domo-work (the only job support corporation for people who stutter in Japan), and a member of the committee of the Japan Society of Stuttering and other Fluency Disorders (JSSFD).My stuttering greatly changed my life. Stuttering was the motivation that drove me to become a clinician and researcher, as well as to establish a self-help group (We-Stutt-Project) and contribute to helping people who stutter land jobs through a non-profit corporation (Domo-Work). My recent research interest is the exploration of ways to help people who stutter throughout their life stages. In my paper below I speak my mind about my recent journey with stuttering and how that has led me down pathways to help other people who stutter. My stuttering heavily influenced my life history in both positive and negative directions. In my elementary school years, I spent six years in a class for special needs children. It was daunting for me to talk with my classmates or teachers and to join groups. Similarly, in my junior high and high school years, stuttering, as well as my personality, troubled me. I faced many conflicts in my teenage years, most of which I instigated. I finally changed my ways of thinking during my years as a university student. There was no special trigger. The first step seems trivial: I decided to study stuttering for my graduation thesis. At that time, I did not imagine a future career as a clinician or a researcher; I was simply a person who stutters and wanted to understand it fully. In my early 20s, I started to meet so many people who stutter (PWS), as well as clinicians and researchers in this field. I heard many people’s voices. Their opinions and ideas resonated with me, given me experience with stuttering. I recognized the value in helping PWS in the only way I could. My experience of difficulties because of stuttering might be useful to other PWS. Thus, since 2013, I have sought to identify the pathways to help PWS. In the process, I have worn many hats: PWS, Ph.D. student, speech-language-hearing therapist, and director of an organization (Domo-Work) that supports PWS employment. In Japan, unlike other countries such as the USA, Australia, and Europe, the number of speech-language-hearing therapists who also have a master’s degree or Ph.D. seem to be relatively low, even more so for therapists who stutter and an academic career. Therefore, I am sure that my career distinguishes me as a PWS in Japan. In this paper, I introduce the practices I have followed for six years. In addition to explaining the four pathways I have studied, I would like to introduce two groups in which I am deeply involved, namely, We-Stutt-Project, a self-help group, and Domo-Work, a support group for PWS employment. Both of them were established less than five years ago, but owing to the rarity and demand for such groups, they grew rapidly. First, I, as a person who stutters, established the self-help group We-Stutt-Project. In Japan, Japan Stuttering Genyukai Association (JSGA) is the largest self-help group for PWS, operating for 50 years. I was sure that JSGA has provided unmeasurable assistance to PWS. However, when I was a university student, I wanted to provide young PWS a space for them to be comfortable. I experienced troubles in life that are specific to PWS, and I knew problems differed according to the age, gender, kind of jobs, and other aspects of PWS. Thus, I recognized the need for young PWS to share their ideas with their peers. This was the reason I established a self-help group. Second, I started to research stuttering, as I am also a researcher. My research interest is mainly in helping and supporting PWS according to their life stages (e.g., entering a university, starting a job, and getting married). I conducted investigations on the school life, job situation, and romantic relationships of PWS, and revealed their actual difficulties and hardship in particular situations. I presented the reasonable accommodations that would address their needs. I thought that the evidence I provide could be useful for PWS, as well as for their parents, friends, colleagues, and partners. In accumulating these findings, I hoped to encourage Japanese society to build a PWS-friendly environment. In the last three years, 13 papers authored by me were published in peer-reviewed journals. Two papers were published in international journals (Iimura, Uehara, Yamamoto, Aihara, & Kushiro, 2016; Iimura, Yada, Imaizumi, Takeuchi, Miyawaki, & van Borsel, 2018), whereas the rest in domestic journals (Iimura, 2015; 2016a, 2016b; 2016c; 2017; 2018; Iimura & Ishida, 2018; Iimura & Miyawaki, 2017; Iimura, Yada, & Imaizumi, 2017; Iimura, Yasui, & Yokoi, 2017; Yasui & Iimura, 2018). Third, I decided to enroll in programs for becoming a speech-language-hearing therapist after receiving my master’s degree. I had previously studied stuttering at Kyoto University for six years (receiving my bachelor’s and master’s degrees). However, the curricula did not correspond with speech-language-hearing therapist education programs. Consequently, I entered Japan College of Rehabilitation and Welfare Professionals to complete a two-year program. After graduating, I earned my license and started to work as a speech-language-hearing therapist. I felt that the time I spent until I first started to treat PWS was exceedingly long. I now treat children who stutter, and seeing their progress motivates me to pursue higher goals. Treating others is one of my pathways. Fourth, I started to support PWS employment by joining the non-profit corporation Domo-Work. At present, I serve as a director of this organization. The details of Domo-Work’s operation are presented later. The two organizations of We-Stutt-Project and Domo-Work in Japan aim to help PWS. Our principal policy is that we accept and respect all PWS ideas, beliefs, and principles. To provide a comfortable environment for young PWS, we strive to understand their ideas and thoughts. Moreover, the members of our management team, including speech-language-hearing therapists, are all young PWS. Our main regular activity is a coffee meet-up, in which we choose comfortably from the coffee shops shown on this slide and this slide. Attendees speak freely on many topics. We hold an interactive exchange meeting; attendees would introduce themselves and discuss topics according to their themes of interest. At times, we practice telephone conversations and presentations. In addition, women who stutter tend to be a minority compared with men who stutter. Thus, we have also planned meet-ups for women only. We also hold drinking parties, especially on New Year’s Eve. Moreover, we hold recreation activities, such as sports games, parties, bowling, and karaoke. We also aim to collaborate with experts, such as clinicians and researchers, and other PWS. We do not want to impose our thoughts on young PWS. Rather, we want them to consider their way of living as PWS. There may be many lifestyles and ways of living with stuttering, and we respect the individual ideas of young PWS. If PWS are unable to provide any ideas, or have few ideas, we could suggest some to improve their experience of life with stuttering. Subsequently, young PWS are given the opportunity to share their ideas as well as grasp the various perspectives of living with stuttering. Sharing ideas on stuttering allows PWS to develop their own perspectives on stuttering and assists them to live more fulfilling lives. Meanwhile, Domo-Work (Specified Non-profit Corporation), established in 2014, is the only organization in Japan that advocates the employment of PWS. “Domo” is an abbreviation of domori, which means “stuttering” or “stammering” in Japanese. The reason we organized this corporation is that most PWS have experienced difficulties in their jobs attributable to stuttering. Workplace support and reasonable accommodations are important; however, they are rarely available for PWS. Based on these realities, our aim is to assist PWS in living joyful lives, filled with hope for the future. Stuttering is a social problem that concerns everyone. We aim to create supportive environments in which the skills and abilities of PWS are used to their utmost potential. We have developed various support activities for both PWS themselves and society at large. First, to improve the communication and social skills of PWS, we provide opportunities for them to practice for a job interview or a conversation on the telephone. These types of situations are more likely to lead to difficulties and negative attitudes among PWS. We also provide feedback on PWS members’ job application form, as well as and advice from and counseling with experts like speech-language-hearing therapists. Second, we aim to improve public awareness and knowledge related to stuttering. At the community level, we are focusing on a campaign to enhance the awareness, knowledge, and understanding of stuttering. We also seek companies that are favorable to employing PWS. Specifically, we have prepared materials on stuttering, including an explanation of the characteristics of stuttering, specific conditions that lead to job difficulties among most PWS, specific reasonable accommodations that PWS want, and examples of where companies have provided successful reasonable accommodations. We organize company visits and employment support centers in universities; the latter assist PWS in landing a job, present potential part-time job clients, and hold seminars for related companies and offices. Finally, we provide PWS with useful information on job offers and institutions or hospitals that offer counseling or clinical therapy. We also provide members with advice on procuring a disability certificate. The organization enjoys the support of many professionals, such as speech-hearing-language therapists, employment counselors, clinical psychologists, and doctors, to provide appropriate recommendations to members. We have received nearly 80 inquiries and consultations in the last five years, and we have supported them through various appropriate ways. The most frequent inquiry we have received is on being introduced to a company that is favorable for and understanding of PWS. The leaflet on stuttering and PWS employment, designed for community awareness, is available for free on the organization’s website. Over the last four months, roughly 1,400 people have accessed to the leaflet. A seminar that we hold for companies and offices provides an opportunity for them to be aware of and understand stuttering. Many participants had indicated not knowing much about stuttering. We find that participants’ attitude toward stuttering improves, indicating better prospects of employment for PWS. I introduced my life story and the course of my life in my 20s. I described four strategies that I formulated to help PWS. I hope that my experience engenders significant gains for PWS. There are so many pathways to help PWS. Various professionals could help PWS, including PWS themselves. People worldwide have many roles, the combination of which could be infinite. People could support PWS in different manners, according to their skills and passion. All individuals, including PWS, possess a unique ability to contribute to society and the economy. I wish that many people, such as PWS, therapists, researchers, and other professionals, would collaborate organically and support PWS wholeheartedly. I also wish for a society that is PWS friendly. It was great to meet you in Hiroshima this summer! I found your article really informative – and I am impressed by all that you have done to support PWS in Japan! Your passion is inspiring! I was wondering what the ages were of the individuals involved in the We-Stutt-Project. I am currently working with a student in Grade 6 who stutters – and would love to put him in touch with you and your organization. He lives in Nagoya and has not met anyone else who stutters. I think it would be powerful for him to be able to connect to others his age, and older, who stutter. Thank you, Jaime. I’m also happy to meet you in Hiroshima! Our talking at Hiroshima was so interesting. I’m looking forward to meet you again. The respondents in our group “We-Stutt-Project” consisted mainly in university students or young adults (roughly ages of 18-40). Thus, your students might be a little younger in this group. However anyway, I and my colleague will welcome you and your student! The local group of “We-Stutt-Project,” called “We-Stutt-Tokai,” regularly holds a meeting once a month / or two month in Nagoya. Or in Nagoya, “Nagoya Genyukai,” that is a self-help group for people who stutter hold an event for children who stutter three times a year (maybe, next event is going to hold at the end of this year..). I hope that contacting anyone else who stutter will encourage him well. Thank you! Hi, Lourdes. Thank you for your comment! Thank you for your insightful presentation. I know there are many who look up to you and it sounds like you are assisting many individuals throughout their journey. I like the idea you presented of pathways that help people accept and provide help with stuttering. My question is, are there ways you would suggest to help people who are younger find pathways, such as school age children? What techniques do you use to help others begin looking for their own pathways? Thank you again. Hi, Krista. Thank you for your praise of my activities! I think it is important for people who stutter (PWS) to provide a roadmap or pathway to enrich their living lives. Your question seems to be a difficult question, but you suggest a important point about as of school-aged children who stutter (CWS). For school-aged CWS, they often have a difficulty holding a vision about their roadmap of their lives. One practice that I adopted is, to hold an interactive exchange event that gathers school-aged CWS, their parents, young PWS, and their teacher (such as resource rooms in school). Young PWS play a example roll of university students, or various career. It would be expected that by contacting young PWS, school-aged CWS could imagine their future vividly and get to know that there are various pathways that they can choose. We hold these events through the group that I introduced this paper. Does it answer your question? Thank you. Yes, thank you! What an awesome idea! I’m both amazed and inspired by your projects! After almost 30 years of children and youth camps I know how important and life changing activities for young pws are. I’m so happy you make them your priority. In Europe we have international youth exchanges for pws. It would be amazing if this could become international, if only through Skype events. Also helping pws to get skills to find a job is an amazing initiative. I’d love to learn more about your projects, how they are organized, financed etc. Will you be at the WC in Iceland next year? Thank you Anita. Your comments so encourages me! I’ve also read your papers and felt impressed of your long time’s attempts. I’m so interested an international youth exchanges for people who stutter, between your association in Europe and my Japanese groups. I wonder if we can cooperate and hold an international exchange event. I’d really like to do this! About next year’s workshop in Iceland, unfortunately I have to attend at an another domestic conference. But I urge to participate next WC! Thank you. It is ok to use Skype or other online communication tools to communicate between our groups! Thank you for sharing your history and the great work that you do. It seems like you are part of a large network of support! You mentioned a variety of groups consisting of young PWS, and also mentioned your interest in research related to helping PWS through various life stages including marriage. I wondered if you had ever considered combining the two and providing a chance for PWS and their spouses an organized chance to talk, meet, and provide support to each other. Is that something that you have done or that you think may have benefit? Thank you for sharing your experiences. Hi, thank you for your grateful comments. In fact, “Domo-Work,” which I mentioned in this paper had ever considered the support of PWS’s marriage once. Because, PWS has often experienced the difficulty to build a close relationship to the other. So we were planning a event that gather PWS and other person who has a good understanding about stuttering. Now we don’t provide a marriage support of PWS, but I feel that it is so worth doing. Thank you for sharing this insightful journey of yours, Daichi! I am an SLP graduate student currently taking a fluency disorder class. It is wonderful that We-Stutt-Project and Domo-Work were created to help young people who stutter. I think people in other countries should learn from your experience and use it as a foundation to create something similar in their own countries. Again, thank you for this informative article! Thank you Pearl for reading my paper! I’m grateful to receive your encouragement. Yes, I’d like to share my activities and know-how, and hope it helpful for people all around the world!